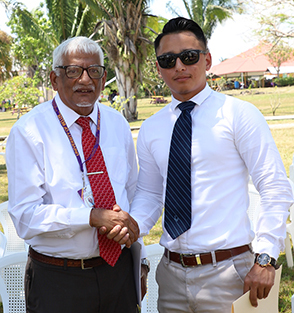 The University of Belize had a plethora of activities for students and prospective students at its Central Campus, Belmopan on April 26, 2018. The day started with the ceremony for the Open Day under the theme “Embracing Higher Education, Sustainability and Purpose” where Professor Emeritus Clement Sankat welcomed everyone to the event. President Sankat noted that, “the theme of this year’s open day “Embracing Higher Education, Sustainability and Purpose” is extremely important, not only for our students’ own development and advancement, but for Belize’s growth and competitiveness as a country. Investing in education in general, and higher education in particular have been embraced by progressive nations as the primary driver to lift young people out of poverty and the possibilities for a productive and fulfilling future. Parents and Governments make significant contributions, sometimes at great sacrifice, to invest in the higher education of their young charges. So let us all continue, to embrace this investment in higher education, in our National University of Belize, so as to bring future prosperity to this nation. The Deans also took the opportunity to speak on the new programs their faculties are launching. Dr. Gordon Holder, Campus Administrator of the Central Farm Campus spoke on the Bachelor of Agriculture that will commence in August and the importance of agriculture for the sustainability of Belize. Dean Chan spoke about a new Master’s Degree in Educational Leadership, Dean Pasos on the revised program in Biology and new programs in Marine Biology and Chemistry. Mr. Gilberto Magaña, a UB alumnus and now Aftercare Specialist at Belize INVEST, a unit of BELTRAIDE, spoke about his time at UB which he says was, “everything that I expected and more”. 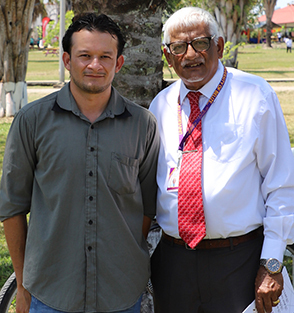 Dr. Santos Chicas, lecturer in the Faculty of Science and Technology, said that his education foundation at UB prepared him to excel when he went to study in the Republic of China (Taiwan). These are two young outstanding Alumni of UB who are exemplars for our current students. Prospective students then had the opportunity to learn more about the different programs, meet their future lecturers and Deans, and experience campus life for a day. The Faculty of Science and Technology also simultaneously held its Earth Day celebration where it sought to create awareness on the importance of avoiding single-use plastics. The Dean of the Faculty Ms. Julianne Pasos, and Councillor Jem Pascascio planted a tree in celebration of the Earth Day event. The Faculty of Education and Arts also had a Psychology of Learning Symposium as well. Students were able to view displays and presentations on the various learning theories and strategies used in the classrooms. The Regional Language Center (RLC) also treated the students, faculty, staff and visitors to a multicultural fair where the international students showcased the culture, music, dance and food of their home countries. RLC currently has students from Cuba, Colombia Honduras, Mexico, Panama, Republic of China and Republic of China (Taiwan). The Medical Laboratory students in the Faculty of Nursing, Allied Health and Social Work were also celebrating Medical Laboratory Professionals Week and were providing free medical tests with results available on the same day. The University of Belize also participated in the National Agriculture and Trade Show (NATS) where prospective students had the opportunity to learn about the new programs that will be offered for 2018-1 and allowed them the opportunity to apply for admission to the University of Belize “free of cost”. The UB Central Farm was present on both days selling their produce and engaging with students about the new BSc Agriculture program and the UB Bookstore was also present selling books and other UB memorabilia. The other Faculties were also present speaking on the different programs that are available at UB and highlighting their respective faculties.